When our Tour and Train participants visit Yad Va Shem Holocaust Memorial in Jerusalem each one has something that strikes them most, each one has some exhibit or video that touches their heart and leaves a lasting impression. For many it is the shoes. 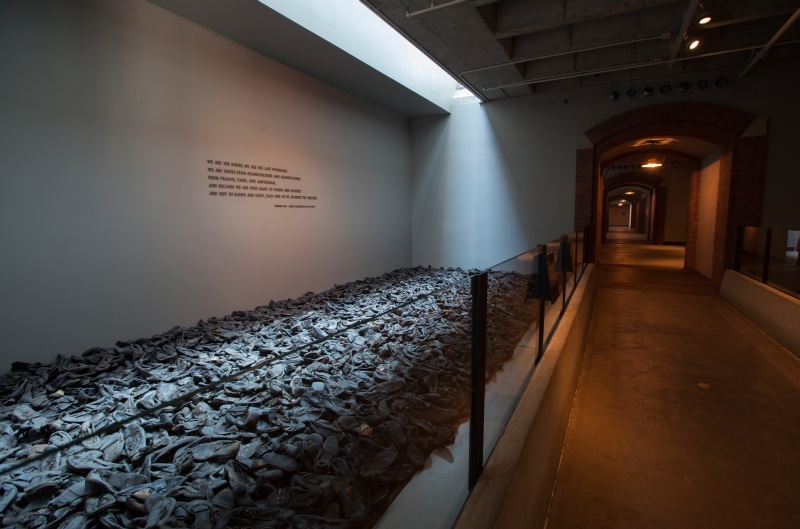 It is the same for those who visit the museum in Washington D.C. and even more so those who visit Auschwitz in Poland. They see the shoes and realize that each pair has a story. Each was worn by a man, woman or child who was murdered just for being "different'. Each pair of shoes is worn out from a journey of life. Where did those shoes walk? What did they see? We shall never know, but we do know this, each pair of shoes starts off as pretty standard, off the shelf, but with time becomes individual. After one has worn shoes for a few months they will never be the same as someone elses' shoes. No two people walk exactly the same, each person leans a certain way, moves a certain in way. In time those shoes become perfectly fitted to that individual, and to no other. Each pair of shoes has it's own life experience, it's own journey, it's own unique story to tell. And so each person. My dear father loved quoting the Talmudic passage, "Do not judge your fellow man until you stand in his place." And we know that since no two people ever stand in exactly the same spot, we can never truly judge another person. Each person reacts differently to an event, each person has their own history and personal trauma. You do not know what another person is going through. The American saying is similar, "You must walk a mile in another man's shoes before you understand him." Equally true. I was just reading another Holocaust book and the authors were desperately trying to understand the actions and behavior of the German Jewish leadership in the period 1933 - 1939 when there was still a slim possibility of saving many Jews. The Jewish leadership totally failed in its task of guiding the community. Looking back, knowing what we now know, it is difficult to imagine what they were thinking. The authors, despite their heavy criticism, are fair to point out that ...given what they know up to that point, given their particular history and given the immense stress they were under, we can never fully judge. All we can do is learn from their mistakes, we can never truly judge. We read about Communism, the Soviet era, how the people were duped and mistreated for so many years, and we wonder. We read books, do our best to learn the true facts, but do we truly ever really understand what a simple family went through? Do we understand the friction between Ukrainians and Russians? Do we understand the complexities of a people's struggles? All we can do is try, and learn. Krav Maga brought me to Moscow where I had the honor of teaching some of the best Krav Maga instructors in Russia and learning a little bit about their history. 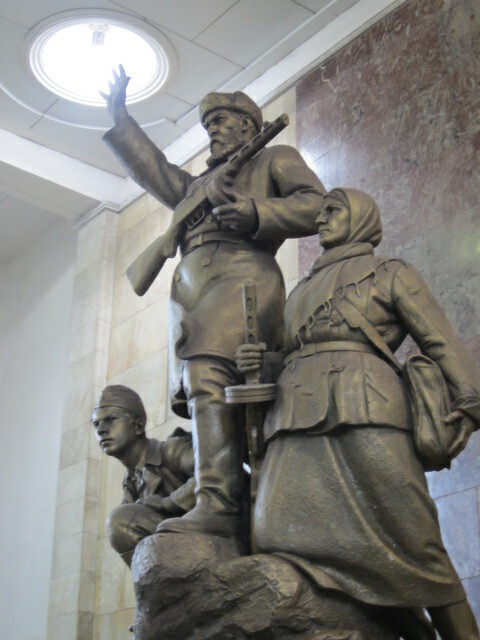 This monument in the subway captures a little of the struggle of the Russian people, common people, soldiers, freedom fighters. When I worked at the bank some clients would snap at me, for no apparent reason. "What did I do?" I wondered, but I soon realized it had nothing to do with me. They may have been caught in traffic, had a fight with their husband/wife, or simply been over tired. I have learned to be more forgiving. When I travel to conduct seminars I hope for the same understanding. Most people do not understand the wear and tear of travel. They expect you to show up bright eyed and bushy tailed. (and I do try). I understand all this. So when my guests arrive for Tour and Train I give them a full day of "Orientation". There is no charge for this extra day. It is on me. On this day I make sure you checked in to your apartments and met your hosts. I make sure there are no misunderstandings between you and your hosts. I take you for lunch, show you the best place to change currencies and to buy food. I drive you around and make sure you are well taken care of. And I understand that you are tired from a long journey. I understand that you may have had trouble with security at the airport, perhaps your luggage was misplaced, perhaps on the plane you were seated next to a child who would not shut up. I understand, but even so, never fully. One can never fully understand the situation of another. Some people come on Tour and Train as a way to heal, to recover. One man came here as a man to deal with the loss of his wife. Others come as a reward to themselves for some great achievement. Each man carries his own unique burden, his own pair of shoes.